This is a copyrighted image. Released on the occasion of a retrospective exhibition curated by the Jeu de Paume Museum in Paris, this magnificent selection of nearly 500 images presents the most comprehensive collection of André Kertész’s work in print. 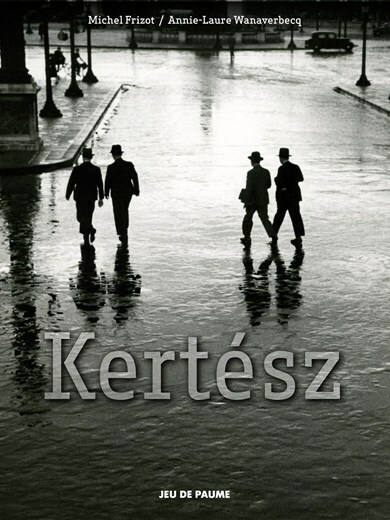 Kertész (1894-1985) was a central figure in 20th century photography, and this compilation makes a clear case for his elevated status. Editors Frizot and Wanaverbecq, both academics and curators, divide Kertész’s work in chronological blocks: Budapest 1914-25, Paris 1925-36, and New York 1936-85. They then further organize the pictures by thematic groupings like ‘Shadows and Doubles,’ ‘Chimneys,’ and ‘Solitude.’ Their accompanying text illuminates some of Kertész’s working methods: for his masterpiece ‘Moudon’, for example, Kertész made and studied test prints of a street scene, then returned to the same site to subtly revise framing and await a further element to complete his composition. In their essays, Frizot and Wanaverbecq make an interesting attempt to isolate individual elements of Kertész’s unique way of seeing (e.g. Kertész’s Hungarian Jewish origins or his ability to view the world with awestruck innocence). Inevitably, the accompanying text falls short of fully explaining these strange and poetic photos, which ultimately speak for themselves. Planes, spatial relationships, and forms are unified into graphic harmony by Kertész’s brilliant eye. Often positioning himself above his subjects, he manages to flatten space bringing disparate elements together into a pleasing composition. One image, a visual haiku of New York’s Washington Square in the snow, blends leafless trees, a busy amphitheater, a cyclist, and a solitary man reading the newspaper. Although his street photography warrants the most attention because of its consistency, variety, and depth, Kertész excelled at other genres as well. The inclusion of portraiture (‘Alexander Calder’ – at work on a mobile), studies in form (‘Distortion no. 40’), and still-lifes made in color with a Polaroid SX-70 (‘Glass Bust’) reveal the breadth of Kertész’s skill. Because the photographs are printed with such rich tones and detail, even iconic images that are perpetually reproduced (e.g.’Chez Mondrian,’ ‘Fork,’ and ‘Satiric Dancer’) seem fresh. A highly recommended addition to any photographic library.